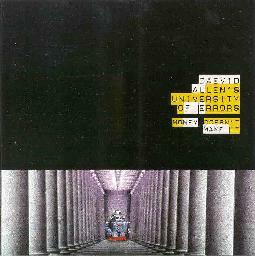 Daevid Allen's University of Errors - "Money Doesn't Make It"
A chance meeting between Gong's Daevid Allen and the members of Mushroom led to the entirely spontaneous formation of 'The University of Errors.' Literally days later, the tracks archived on "Money Doesn't Make It" were recorded, and now less than a year later we can all enjoy the results of this synergistic pairing. The mixing of Daevid's unique word-play compositions with the improvisational genius of Mushroom's core members has produced a fine work of art, but one that also has a message and a heaping of sly humor. Daevid (it doesn't seem right calling him 'Allen') wasn't blessed with the world's best singing voice, but here he puts on quite an excellent vocal performance. And even though there is no hint of synthesizers (or keyboards of any kind) herein, it retains a truly cosmic feel throughout. From the opening title track, Daevid gets straight to the point, that being a general cynicism with modern technology and the commercial hype of the western world. "Burn your money, free that child. Don't teach children to work a crooked mind." He delivers these words of wisdom in a somewhat rappish style against a phased-out rhythm section (?) and Josh Pollock's psychedelic guitar wizardry. On 'Prince of Sidewalk Scooter,' Submarine Cap'n Michael Clare lays down a fabulously smooth bassline that seems to grab up all the other instruments and carry them along on a blanket of air. Oh, this is a wonderous nine-minute piece, ethereal bits of gliss guitar sprinkled amongst more inspired ranting from Daevid ending simply with, "Throw your computer in the trash." How often I get that urge... but the thing is, my computer is where I write these reviews. Sorry. From ranting and rapping, we switch to chanting and incantations for 'False Teacher' and 'Mullimbimby Mother,' as the band jams along to an Eastern 'tune.' Erik Pearson, another Mushroom protagonist, adds some excellent flute touches to a mix of swirly, often phased (or treated) strums and drums, and a partially hidden (but inspired) guitar solo from Pollock on the latter. The latter part of the album is a collection of shorter, more peculiar bits and pieces, highlighted by the heavier riffing in 'Talkwind Upswerve' and a reprise of the title track. Here, studio trickery results in a herky-jerky cut-and-splice reading of "Burn Your Money." Effective way to wrap up 45 minutes of very strong material. I don't know where this union of Bay Area musicnauts and the 'Astral Alien' will eventually lead, or even whether it will continue with regularity (the planned live dates are a promising sign), but this is the strongest release from the Gong family I've heard in a long while. It's the kind of thing though that certainly feeds on spontaneity - so I hope future efforts also happen without any prior planning, as it seems to have worked wonders on this debut effort. Go out of your way to track this one down, if you can. For more information you can visit the innerSPACErecords web site.